Experiment No. 1: Amber Spice Solid Perfume from Fragrant by Mandy Aftel. Out of respect for the author, I won’t publish the amounts – you’ll need to buy the book for that. But I will tell you what supplies you need, how to do it, and and how it turned out. What I like about Mandy’s recipes is that they are the perfect “experiment” size. They fit neatly into a 1/2 oz metal tin. No waste! 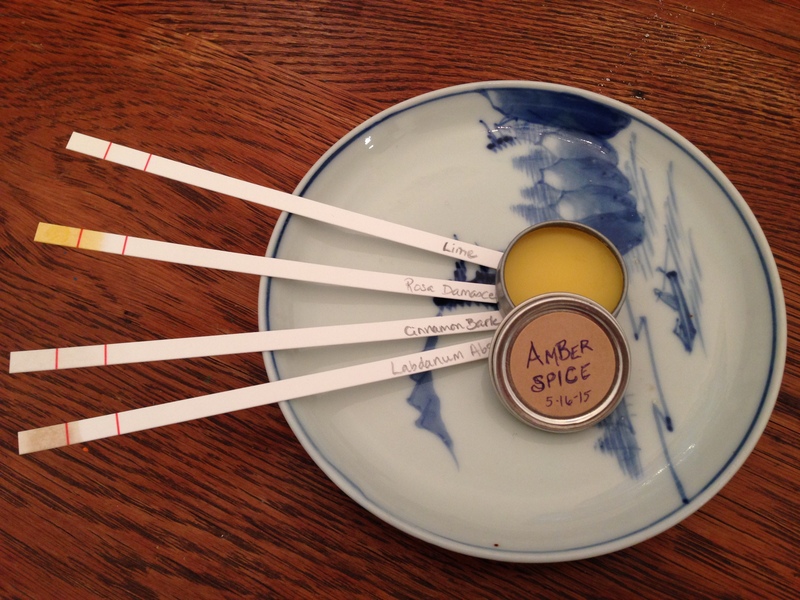 First, I tested each of my raw materials by placing a single drop on a labeled fragrance tester strip. It’s helpful as I’m learning to smell each oil individually – to discover the shape of the material itself, its intensity, longevity, etc. Next, I set up my work area and laid out everything I needed in easy reach. Paper towels everywhere in case of spills. I poured the Jojoba oil into the graduated beaker, and then added the essences to it. Be very careful to use a new dropper for each oil, and put used droppers into the shot glass of alcohol to clean them. You want to be extra careful not to cross-contaminate your oils. I added grated beeswax to the lab casserole, and melted it over a hotplate. Once melted, I added the oil + essences, and stirred together as quickly as possible and removed from heat. Finally, I poured the perfume into the tin, capped it, and waited 15 minutes for it to solidify. Finis! Labdanum Absolute, Spain Wild Harvest, White Lotus Aromatics – Resinous, sweet, thick, a tinge animalic, fuzzy, smoky, leathery. Cool brown liquid. Cinnamon Bark EO, Sri Lanka Organic, White Lotus Aromatics – Bright, hot, spicy, candy sweet, POTENT. Clear liquid. This is the strongest EO I’ve ever smelled. It made my eyes water. Careful with this stuff. Rose damascena absolute, Turkey, White Lotus Aromatics – honey sweet rose, mellow and round. Yellow-orange. Lime Essential Oil, Expressed, Mexico, Eden Botanicals -Sweet, bright, cheerful, acid, citrus, sharp. Clear. Quite nice, actually. It’s amazing how well the scents meld to create a new thing. The top and base notes were most prominent to my nose. A good strong hit of lime up top that fades fairly quickly, and the labdanum makes a sweet, leathery, ambery base that is apparent throughout the arc of the perfume and into drydown. At first, I had a hard time picking out the cinnamon – where was the cinnamon? But I realized it had been transformed into a sparkling, hot brightness that did not read as “cinnamon.” Nice. I could not find the rose at all. Perhaps it was rounding things out, or perhaps it was simply buried. Overall, it felt unisex – perhaps leaning slightly masculine. Wears soft and close. My husband (not a fumehead) had an interesting insight. One sniff, and he said, “Cherry coke!” That puzzled me for a minute, then I looked up the formula for the original Coca-Cola – and sure enough, there was a lime-citrus-cinnamon combo. I spilled the Jojoba. How on earth does one pour out of a Boston round without sloshing? Need to be careful to get all the perfume oil out of the beaker. Cheap hot plate was ok but it smoked unpleasantly – need to clean? How do you clean the droppers?! I got a trace amount of cinnamon oil in the cap of a dropper, and then after bathing them in Everclear, I ran all my droppers and caps through the dishwasher to sterilize. Now ALL of the smell like cinnamon. I curse you, cinnamon!